My husband, David, and I watched the two-part documentary together. After the first night, we sat and talked. David asked me how I was feeling after watching this because the descriptions the men gave of the abuse was graphic at times. It was hard to hear, to imagine the little boys being abused in those ways. All I could feel was sadness. It stirred my heart to hear a story I have heard so many times before. The stories of survivors all share similarities of denial, fear and avoidance. But I did tell him that I no longer felt shame in my body about the abuse I suffered when I heard the stories of others. It was not easy and took decades of work but I have cleaned out the deep tangles of shame and guilt from my body and heart. Not to say that shame never shows up in other ways, like when I am pushing myself out of my comfort zone or am learning something new about myself. I have to be mindful and present to catch how hard I can be on myself sometimes. But I could tell my husband was struggling with his feelings. He explained that hearing the two men share their struggles and how it had impacted them had made him reflect on himself. He realized that he connected to their stories. He told me, "I forget that this is in my past and that I too was a victim. What they are struggling with, I have and am struggling with, and I have forgotten why." It was plain to see that this was hard on him. He did not say much more than that evening and I did not press him. But the next morning we picked up our conversation again. Over our morning coffee, we talked about the documentary, wondering what part two would show us that evening. As we were talking, he broke down in tears. He expressed the shame that he could feel about the abuse he suffered, that hearing about the abuse these two men suffered reminded him of that. He was abused by an older man when he was a teenager and there was also abuse when he was a young boy. He cried so hard, he was shaking. My world came to a halt for a bit as I sat down on the bed and faced him, keeping my breath calm and my heart open. It was hard to see him hurting this way but this was not about me. This was my husband sharing hurt he has been carrying for a very long time. It hurts our hearts when the people we love are hurting. I pushed past my hurt, wanting my husband to experience loving acceptance and warmth as he cried and cried. I offered to sit closer to him but he said no. I knew he needed space and I honored that, his feelings, his hurt, his need for space to let it be fully expressed. David shared that he felt it was his fault. He felt guilty because he liked the attention he was getting from the abusive men in his life and he got something out of it. For a long time, he felt the mixed emotions of fear of this secret and the inner shame that it was his fault. Through his tears, he expressed relief in naming the truth and feeling grateful that he could speak about this openly and finally realize the toxic impact of the shame he had been carrying for so long. Being a witness to my own healing journey has helped my husband to see that he is not alone. But living with another survivor created another way for him to cope with his pain, which was to downplay his own. In his mind, the abuse I suffered was always worse than his. I was the one with the big issues in our marriage for a long time. I accepted that role and was committed to my healing but as I learned about trauma and healing and began to change, I also started to become more aware of my husband's challenges. I could spot the signs of denial, blame, coping and exhaustion, now that I had recognized and worked on them in myself. But his pain, his trauma was not mine to heal and I couldn’t heal it for him even if I tried. So I made sure to stay focused on my healing, to model for my husband what is possible. Coming out of our conversation, David thanked me for this, for modeling that healing is possible. In the past years, he saw the changes the healing was creating, the fulfillment I got from my self-care and self-awareness. Healing is not always fun or pretty. We both know the reality of this but we both know it was worth it and it is possible. I reminded him that he is the reason I am here today, doing what I am doing, living the life I have. He has been the supporter and the only person that believed in me for a long time when I had no one else. He has been the person that I have practiced being me to, the authentic me, the me that was too scared to love or to let anyone in. He was that safe person that helped me trust again. For over 15 years, my husband would tell me what I needed to hear, over and over, as many times as it took before I could finally believe him. And now I used his words and told him what he needed to hear: “I love you and I am not going anywhere. No matter what you say or do, I am not going to stop loving you. My love for you will not change.” I believe in that. Once you love someone, you always love someone. You may not like them or want to be around them all the time but you can still love them. That evening we watched the second half of the documentary. By the end of it, I was crying. I was moved by how the two men finally realized they needed to disclose the abuse. (Spoiler alert!) It was when they had their own kids. When they pictured Michael treating their sons how he treated them, and they felt disgusted and angry about it, they finally realized that the interactions they had with Michael had been abusive, not loving. If they didn’t want this to happen to their sons, why had they not felt disgust and rage over it happening to themselves? Because the abuse had started when they were so young and was being done to them by someone they idolized, their young brains interpreted the abuse as love. And it was doubly confusing because Michael told them that he loved them, that they had a special bond, that he would always take care of them. And children will believe adults because adults are the ones in charge, the one who they rely on to survive. A child doesn’t come into the world thinking adults aren’t trustworthy. Children love their parents unconditionally and so all adults must be as amazing as Mommy and Daddy are. The two men had been struggling with crippling anxiety and depression up until that point. They were turning to substances to numb themselves and couldn’t understand why they felt so angry and sad and distant all the time. When they saw themselves in their little boys, it dawned on them that abuse had taken place and the burden of the secret was affecting everything in their lives, their mental and physical health, their relationships, their careers. They both realized they would only be able to heal once they started talking about it. I could go on and on about the devastating impact trauma has on us. Most of you reading this already know it too. What I am reminded of over and over again is that it is not the abuse itself that hurts us the most. It is the fact we can't and don't know how to talk about it, to make sense of what was being done to us. The confusion and devastation that is inflicted on children and adults when someone we love, trust, and in many cases we see as larger than life, takes advantage of our love, our bodies, and trust. We know how to keep secrets from a young age and we keep them at a huge cost. The cost is our life force being used to contain something dark instead of being used to fuel our light and our spirit that is our birthright as we come into this world with gifts to share. Our energy is forced to carry a burden that wasn’t ever ours to carry instead of using that energy for ourselves. No matter where you are on your healing journey, keep going. Keep sharing your truth about what was done to you as a child. Find a safe person. Someone you can trust. If there is confusion, keep sharing. Find others like you that have been confused but now understand what caused it and can remind you that you don't have to keep that secret anymore. When we can let the secret and shame go, we free up so much energy for living and for love. My husband was grateful to get his feelings out, to be able to share openly, and his energy has been lighter ever since. And we both know that it is a process, not a one-time event. We are not done, not as parents, not as a couple, not as individuals healing from trauma. Our mission continues each and every day, to support each other and become the best version of ourselves, to model for our kids what self-love, self-care, and self-compassion look like and sound like. To strip away the burden and shame of our trauma, one layer at a time, and stopping the cycle of abuse with us. I hope that you feel empowered and motivated to speak up and tell your story if you haven’t already. These men are so brave for coming forward and telling their truth, not just to their families but to millions around the world, on a public stage. But remember that you have just as much courage within you to do the same, to speak up and release the weight on your heart. It’s been there long enough. It’s time to free up your life for love, healing, and passion. You are as capable of change and healing as anyone else. You just have to take the first step. 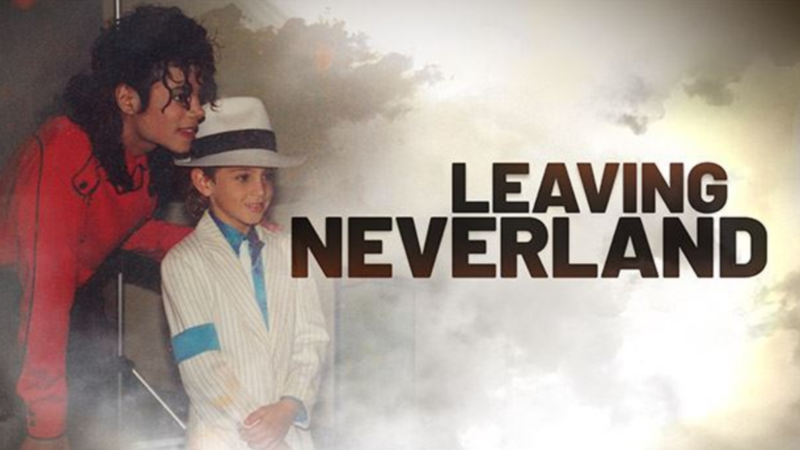 Also, if you haven’t watched Leaving Neverland already, (it’s on HBO) I would highly recommend doing so. It’s an important film for creating a conversation about the impact and prevalence of child sexual abuse and especially important as our society navigates dealing with the abusive behaviors of people with the power and fame to escape the consequences. But I’m letting you know there is a trigger warning so be kind and careful with yourself when you sit down to do so. Ready to dig deep? Tired of feeling bad about the past? Feeling stuck? Don’t worry. I can help! Just follow (this link) or call 619-889-6366 to reserve a one-hour coaching session with me ($125). Let me help you with the next step to healing your life. You deserve it! Reserve your spot NOW! Check out my NEW YouTube channel, I go live Tuesday and Thursdays at 4 pm pst/7pm est. (most weeks) to connect with the readers of my books, answer questions about healing after trauma, and discuss an important part of healing! Remember to subscribe to receive updates of new videos or Livestream events.